Zemic Europe: De IJsselmolen is a modern Dutch family business that produces raw materials for the food industry. The sustainable production of food-safe products, with respect for people and the environment, requires state-of-the-art automation. The control of processes and organizing this as efficiently and effectively as possible makes De IJsselmolen a very modern company. Zemic has examined the various silos together with De IJsselmolen. In this process, we looked together at the best solution in the field of force sensors, siloweighing modules and electronics for the efficient monitoring, weighing and dosing of these silos. The strength of De IJsselmolen is the grinding, mixing and packaging of raw materials for the food industry in a fully automated factory. All this should be as reliable as possible with high flexibility to the customers. De IJsselmolen supplies raw materials for foods to the business to business segment, both inside and outside the Netherlands. Weighing the right amount is an important step in this process. An accurate and proper selection of the most suitable force sensors in combination with built-in modules and electronics was therefore necessary. The specific requirements and wishes of force transducers were discussed during a brainstorm session with De IJsselmolen. Zemic then advised the best suited weighing components, the capacity for the force sensor and the most suitable mounting module advice for the force sensor & silo. In addition the best electronics for an easy system calibration. By implementing these weighing components De IJsselmolen has created an accurate and efficient process and they see the benefits every day. By means of a mobile app, developed by De IJsselmolen, it is possible to monitor exactly how much weight is in which silo. Via the same app, processes can be started or interrupted from anywhere in the world where internet is available. De IJsselmolen is a company where many facets for making raw materials for the food industry come together. The raw materials are delivered by means of containers, tipper or bulk trucks and then unloaded. This requires an extremely careful income control where quality is of the utmost importance. De IJsselmolen thus complies with strict standards such as FSSC22000 (Food Safety System Certification), Iso and GMP plus. In the production facility where the Zemic load cells are installed under silos, there is grinding on different production lines using different techniques. In addition to grinding raw materials, raw materials are also mixed from different products. After grinding and mixing then packaging takes place in paper valve bags, polyethylene bags or big bags. The processing of gluten-free products is done on separate production lines. Besides this, De IJsselmolen provides customized services in accordance with the specific requirements and / or wishes of customers. In most of these processes, weighing and / or the mixing and dosing, of raw materials, play a major role. The Top-Sensors T2 weight transmitter offered by Zemic is suitable to connect directly 1, 4 or even 8 loadcells directly to the device. 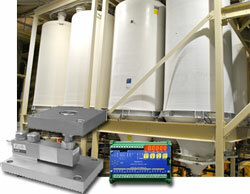 A weight transmitter provides excitation voltage which is needed for a loadcell or load cells (the input). The T2 weight transmitter converts the weight signal (in general 2 or 3 mV/V at full scale) into a 4-20mA output, 0-10V output, 0-5V output or communicates by fieldbusses like Profinet, Profibus, CanOpen, Devicenet, Ethernet etc. Sens2B - Sensor to Business is the international measurement technology and sensor suppliers directory / sensors portal. Sens2B does not manufacture or sell any sensors or measuring devices. You find in the Sens2B database sensor manufacturers, sensor suppliers and distributors (distribution & representation companies) of all kind of sensors, transducers, transmitters, measurement instruments, devices, probes, meters and detectors.